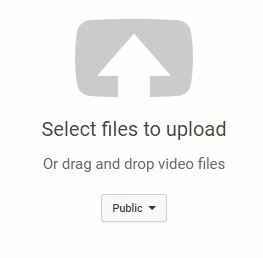 Here are simple instructions for uploading videos from your computer or from Google Drive. First, login to your YouTube account. Click the arrow icon above the “Public” drop down (the white arrow in the gray box on icon above). Choose your video from your computer and follow the prompts to upload the video. If you have videos on your Drive, I believe it will find them automatically and the videos will show up on the pop up after you click Import. Choose the video(s) you want to upload and follow the prompts. 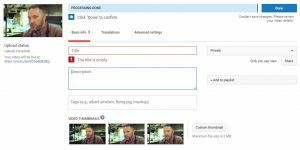 Once your video(s) are upload, add a title and description using your keyword one time in both the title and description (it’s ideal to do keyword research before creating videos to see what people are actually looking for) but use them as best you can. Fill in your title and description fields focusing on one KW if you can.